Back in the late 90’s early 2000s the Wrigley/Lifesavers candy company came out with this line of candy that they called Creame Savers. You guys (at least those of you in the U.S.) remember those? For those that don’t know about/or remember them, the Creme Saver was similar to a Life Saver in that it was a fruit based hard candy except that the fruit flavor was combined with a cream that gave it a distinctive, rich/thicker texture when you sucked/bit on it. The first flavor that they put out was Strawberries and Creame, but it didn’t take very long before they became HUGELY popular, resulting in a rapid succession of other flavors: Oranges & Creame, Raspberries & Creame, even Chocolate & Creame. There was Creame Savers hard candy, Creame Savers soft chew candy, Creame Savers jello, and even Creame Savers flavored yogurt. For a while, it seemed like Cream Savers were just everywhere. Then all of a sudden…they weren’t anymore. From what I understand Wrigly has recently started selling the Strawberry flavor in a new limited release in certain locations, but the Creme Saver craze has definitely died down from what it used to be. I’m not a huge candy fan, but I did like Creme Savers. When I was making today’s recipe, I thought about them and how much the combination of strawberries and cream is just always so much win. It’s one that was just made for summer. In summers like this when me and my sisters were younger we used to get cans of Reddi Whip whipped cream along with a carton of strawberries from the grocery store. We would wash/hull the berries, get out forks and take turns passing around the can of whipped cream, filling the berry cavities with whipped cream and eating them raw, just like that. I may have lost my taste for Strawberries and Creame candy, but I’ll never lose my love for strawberries and cream in shortcake or just all on their own. Also, strawberries and cream in cupcakes. I will probably nevereverever lose my taste for cupcakes. And if I ever do, somebody give me two tight slaps and ask me if I’ve lost my mind; the answer in that case would probably be a most definite “yes”. If there are some of you who may unfortunately think you’ve lost or never really had a taste for cupcakes, then don’t worry. I’m not going to give you two tight slaps and ask if you’ve lost your minds; I mean, I could. But I think a much better, more effective solution would be to just present you with these: Strawberries and Cream cupcakes. These cupcakes are very simple, no-frills and little fuss… but then, good things in life oftentimes are. So, as I said before, this a very simple recipe. You can make these from start to finish in the space of about 1.5 hours. However, don’t let you think that that means the taste is simple. The secret weapon in this recipe is the use of the fresh strawberry puree. 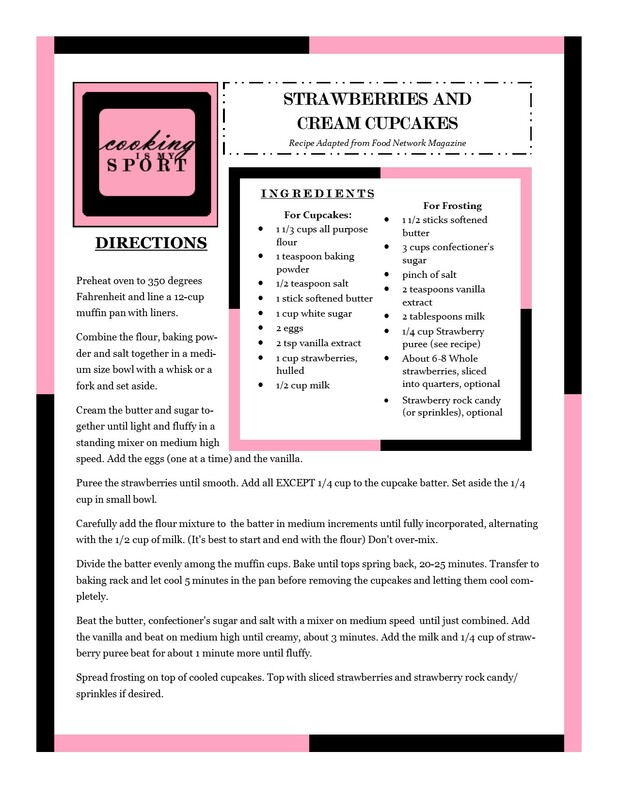 It adds that tart strawberry flavor to the vanilla based-batter while also balancing the sweetness of the frosting beautifully, somehow managing to make it taste light and airy–the texture is actually very similar to whipped cream. Plus, doesn’t it make them look so pretty-in-pink? I’ll be at the Fiesta Friday #130 party this week with these cupcakes. You should come out and get one while I’ve still got ’em. Preheat oven to 350 degrees Fahrenheit and line a 12-cup muffin pan with liners. Combine the flour, baking powder and salt together in a medium size bowl with a whisk or a fork and set aside. Cream the butter and sugar together until light and fluffy in a standing mixer on medium high speed. Add the eggs (one at a time) and the vanilla. Puree the strawberries until smooth. Add all EXCEPT 1/4 cup to the cupcake batter. Set aside the 1/4 cup in small bowl. Carefully add the flour mixture to the batter in medium increments until fully incorporated, alternating with the 1/2 cup of milk. (It’s best to start and end with the flour) Don’t over-mix. Divide the batter evenly among the muffin cups. Bake until tops spring back, 20-25 minutes. Transfer to baking rack and let cool 5 minutes in the pan before removing the cupcakes and letting them cool completely. Beat the butter, confectioner’s sugar and salt with a mixer on medium speed until just combined. Add the vanilla and beat on medium high until creamy, about 3 minutes. Add the milk and 1/4 cup of strawberry puree beat for about 1 minute more until fluffy. Spread frosting on top of cooled cupcakes. Top with sliced strawberries and strawberry rock candy/sprinkles if desired. Posted	 July 29, 2016 at 2:32 pm by Jasmine S.
Fresh strawberries in cupcakes have got to be one of the best things ever. This looks amazing, Jess! These look so wonderful, Jess! I have yet to make strawberry cupcakes. I love cupcakes. I don’t know why I haven’t made this kind yet. They are very pretty and must taste great with the fresh puree! This was actually my first time making them Shari; I didn’t know why I’d waited so long either but God am I glad that I did. Thank you! Those are so beautiful! My two girls would love them! Thank you for sharing! Thank you ma’am; it’s ridiculous sometimes how much *this* girl loves her sweets. I’ve got to fight to keep it in check lol Happy Fiesta Friday weekend to you! These ARE pretty in pink! I love the sprinkles, the flavors, everything! 🙂 I do remember that candy, but only vaguely. I totally remember Creame Savers! I agree with you, the combination of strawberries and cream is always a winner 🙂 This is proven by these delicious looking cupcakes! Weren’t they the greatest Heather? I have no idea why they pumped the brakes on selling them–sometimes I really do miss the taste of the Strawberry ones –Thank you! These look so pretty and summery 😍 could you check out my blog ? !